The horseshoe crab is a remaining offshoot of an ancient species. Considered to be "living fossils" due to their impressive family tree, these animals are more closely related to scorpions and spiders than crustaceans. The horseshoe crab is found on soft, shallow and sandy beaches throughout the Gulf of Mexico and the North Atlantic. The crabs’ adult bodies can be anywhere from 7 to 60 centimeters in size; their entire body is covered by a hard, sandy-colored shell. 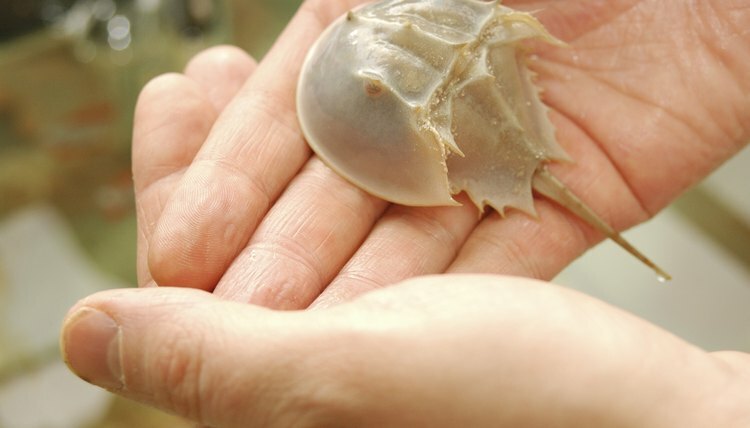 Horseshoe crabs are not poisonous and can be picked up with care if they need to be moved. Locate the crab's shell. If the crab is on its back, slip your fingers between the shell and the ground. Wrap your fingers around the shell securely, avoiding the tail. Make sure your fingers grip the edge of the shell firmly but not tightly. Larger specimens may require both hands. Lift the crab carefully, taking care to avoid their tail and legs. Do not attempt to pick up a horseshoe crab by the tail; their tail joint cannot support their weight and the tail can break off.